That which is of God is light; and he that receiveth light, and continueth in God, receiveth more light; abd that light growth brighter and brighter until the perfect day. Doctrine and Covenants 50:24 As I have watched and observed many wonderful sisters around the world, living in very different but often very challenging circumstances, writes Sister Harriet Uchtdorf, I have marveled at the magnificent women in this Church who radiate such peace and joyful confidence. wmen have an instinctive ability to influence and lift others as they radiate the light of the gospel. 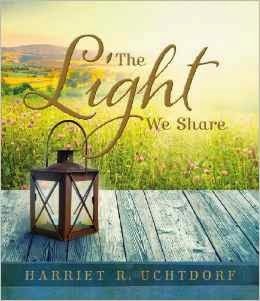 In this charming, small-size book, Sister Uchtdorf reflects on the power of heavenly light in her own life and recalls the joy it brought to her family during a dark and difficult time. It was like a miracle, she explains as she describes how hope came back into their lives. Discover how the light we share can make a life-changing difference to those whose lives we touch--as women, family members, leaders, teachers, friends, and sisters in the gospel. If you're looking for a lovely little book to give as an Easter gift or for Mother's Day, this would be a great choice. Profound in it's simplicity, this book touched me with its personal stories and sweet testimony of light and love. It made me think about what I can do to give light to those around me. The pictures are beautiful. It's a wonderful, little book.